The grocery game, already led by a handful of corporations with sprawling brand portfolios, is about to get a beefier new player. 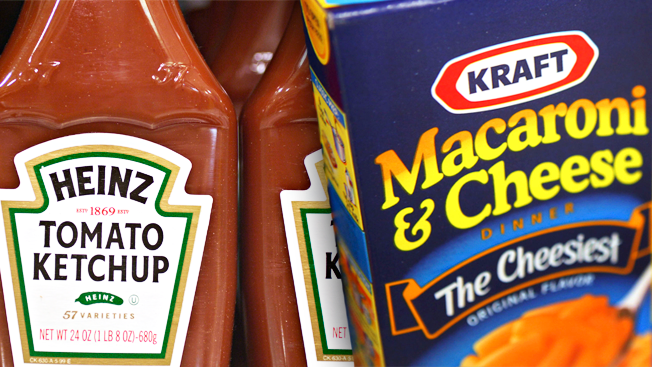 Kraft Foods and Heinz announced today they will merge to form The Kraft Heinz Company, with an estimated $28 billion in annual revenue and eight $1 billion brands. Backed by a $10 billion investment from Warren Buffett's Berkshire Hathaway and 3G Capital, the merger will pay out a $16.50 per share cash dividend to Kraft shareholders. Existing Heinz shareholders will own 51 percent of the new entity, the company said in its merger announcement. In 2012, Kraft split into two companies, with snack brands like Oreo becoming part of Mondelez International and grocery staples like Kraft Mac and Cheese becoming part of the new Kraft Foods. Today, Kraft Foods includes brands such as Jell-O, Oscar Mayer, Planters and Kool-Aid. Heinz's portfolio includes its signature ketchups along with brands like Bagel Bites, Ore-Ida and Classico sauces. The merged company says it will be North America's third-largest owner of food and beverage brands and fifth largest in the world. It will be co-headquartered in Pittsburgh and Chicago.